The Baltic countries see the Russian Federation as a danger. Russia, on the other hand, wants to be recognized as a global superpower. NATO and the EU weigh the moods in the region. Untangling yourself in such a puzzle is not easy and all the actors are well aware of how delicate the situation is. At stake there are factors that go beyond the local framework, because they also include distant countries that apparently do not come into play. Moscow does not have a hostile public opinion in foreign policy and has a direct and closed, fast and pragmatic political system that makes it determined and the Baltic area is a strategic defensive cornerstone. In essence it can make quick decisions. The Kremlin has the earth-sky control of the strongest borders in the world and it is Kaliningrad, Russian enclave, the epicenter of the entire local defense system (A2 / AD anti-access / area-denial). Around the enclave they saw, in response to NATO, the following repositioning: missiles Iskander-M (maximum radius 500 km, in the photo); S-400 missiles, long-range air defense; missiles Bastion coastal defense; missiles Kalibr long-range. All to cover against land-sea targets. Furthermore, the high mobility of the Russian army over long distances concretizes the numerical reversal in the area. In addition to fearing missile, naval and terrestrial alignments in the Baltic, they are horrified by the idea of ​​closing the corridor of Suwalki, just wide 65,5 km between Kaliningrad and Belarus (a strong ally of the Russian Federation), and the penetration of a critical and antagonistic thinking to NATO. Moscow, on the other hand, fears NATO membership of Sweden and Finland. In the face of all this, the Kremlin could use provocation to curb US power, while cooperating on some issues, but avoiding situations that Americans could interpret as weakness. Part of the US-Russia agreements for some areas of the globe, such as Iran's nuclear programs, will be based on the Baltic situation. A relationship intelligence, of a Nordic country, argues that Russia could use theintelligence offensively with hybrid, IT and impact campaigns to create disagreements between NATO and the EU, thus weakening the ability to persuade Russia's buffer countries. It is the less visible but more difficult to identify aspects that analysts worry: controlled media, hackers, opinion leader, publishes adverse opinion with themes that are dear to the people (immigration, relations with EU states, situation in the Baltic Sea). Widening the range in the area between Warsaw, Copenhagen, Stockholm, Helsinki, in this case Denmark, Sweden and Finland as they move with NATO are viewed with suspicion by Russia. The EFP (Enhanced Forward Presence) reinforces Poland and the Baltic countries a little. 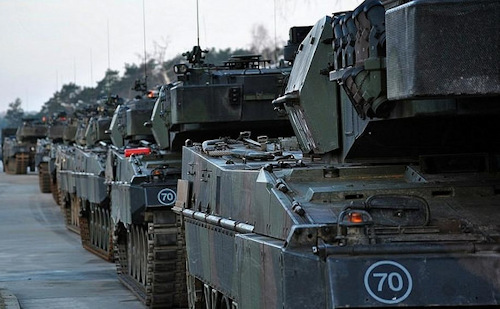 Warsaw calls 53.000 reservists and new 128s Leopard 2PL and invests $ 4,7 MLD in the defensive system Patriot. Lithuania allows paramilitaries to have sophisticated weapons: it means that apprehension is high. In this escalation Russia is seen encircled and must not show weakness. What happens in the Baltic Sea also has repercussions in distant areas such as the Arctic (Denmark). For example, if Denmark refused to Nord Stream 2, for Russia it would be pro-US action and therefore a danger. US long-range non-nuclear carriers and NATO missiles are pushing Russia to give priority to strategic nuclear weapons, as a deterrent, and to economic compensation; without neglecting long-range coastal defense. Moreover, Unmanned Aerial Vehicles (UAV), command and control systems and electronic warfare capabilities have significantly improved. The Kremlin sees, in former Soviet territories, spheres of interest and security zones in defense of its strategic depth in the event of military conflict with NATO. Kaliningrad it is strategic. All the Russian dynamism is aimed at creating a defensive system able, eventually, to inflict serious damage in the area, to preserve the supply to the enclave and to reduce or even to zero the regional mobility in the Baltic Sea. The point is strategic-political: if the perception of a reduction in the capacity of intervention in NATO in support of the Baltic countries was created, the will of the same would be seriously challenged to undertake initiatives aimed at damaging Russian supremacy in the region. Sweden and Finland are under constant observation of Russia for possible accession to NATO, which would be understood as a strong squeeze. The social question of the Russian linguistic ethnic minorities of Estonia (28%), Latvia (33%) and Lithuania (9%) by Russia, which sees them as part of its historical sphere of interest, deserves to be investigated. The Russian Federation has lost its direct influence as a member of NATO and the EU. And this is the real problem, for the three small Baltic states, because pro-Russia public opinion might spring up on the horizon, which could animate local politics. This would guarantee the Kremlin the possibility of weakening the internal front of pro-NATO and EU compactness. But not only that, because if necessary the Russian Navy conducted simulated attacks on Western warships: the memory of the attack against the Danish ship is still alive Esbern Snare, January 2018, which brought EFP contributions to Estonia. Therefore, the Baltic countries are finding themselves at the center of the Russian defensive strategy that aims at regional influence even outside the national borders and the strategic line starts from the Baltic to the Black Sea. The situation in Ukraine has been the driving force behind the requests of Estonia , Latvia and Lithuania to have NATO's collective defense commitment, but the chances of a Russian attack on the three Baltic countries are currently out of the question, because the goal is only to raise NATO's credibility.